Christian Feltz is a character in the HD Universe who appears as a minor character in Grand Theft Auto V. He is voiced by John Mooney. Christian Feltz is, in 2013, a computer and security hacker who can be selected by Michael De Santa to join his crew on certain heists. Commanding a 10% cut from heists, Christian's initial skills make him a more competent choice than Rickie Lukens; however, he is not as proficient as Paige Harris. If chosen, Christian gives the crew a 60 second window before the alarm resets itself. Michael shows frustration towards the relatively small window given what Christian is getting paid for the job. 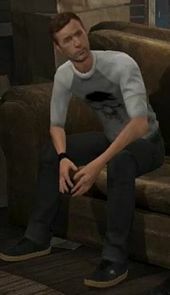 If the player chooses the "Roof Approach" and selects Christian for the first time, he competently guides Michael through the mainframe hacking process, but is unable to shut off the sprinkler system; however, if Christian was used during the Jewel Store Job, then he uses a security exploit to get the sprinklers turned off. If the player chooses the "Subtle Approach" and selects Christian for the first time, there is a 2 second delay between traffic light changes; however, if Christian has experience from at least one heist, then traffic light changes are instantaneous. Christian is apparently susceptible to motion sickness, as he complains about getting sick during the river chase during the Vangelico heist. Christian has a slight stutter in his voice. This page was last modified on 4 April 2015, at 15:41.